This is the documentation for eGenix PyRun in HTML format. 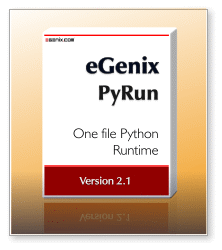 eGenix PyRun™ is our one-file, portable, no-install version of Python, making the distribution of a Python interpreter to run based scripts and applications to Unix based systems as simple as copying a single file. ● Small footprint: only about 11 MB in size for Python 2.x and only around 13 MB for Python 3.x. Can be further compressed down to just 3-4 MB using e.g. upx. ● Python 2.6, 2.7 and 3.4 Support: PyRun works with all popular Python versions. We chose the single source approach for achieving this, but had to drop Python 2.5 support as a result. ● Cross Platform Support: PyRun runs on the following platforms: Linux, FreeBSD and Mac OS X. ● Full 64-bit Support: PyRun can be built on both 32-bit and 64-bit builds on all supported platforms. ● Highly Portable Codebase: in addition to the already supported platforms for PyRun, we provide custom porting services for more exotic platforms. ● Easy Installation: Simply drop the executable into a directory and start using it. No installers, no packagers and only a minimal set of dependencies needs to be provided. ● Fully Relocatable: eGenix PyRun uses relative search paths, so you can easily move the installation around. ● Compatible with setuptools, easy_install, pip: Great care was taken to make sure that PyRun can be used with setuptools et al. ● Perfect virtualenv replacement: PyRun provides an even better level of isolation from the system installed Python version. Instead of using symlinks and other tricks to create a virtual Python environments, PyRun comes with a complete Python runtime and thus doesn't need to play any tricks. ● install-pyrun script: Using the bash script install-pyrun, we make the whole installation process even easier. It automatically downloads and installs the right version for your platform and also take care of adding setuptools and pip to the PyRun installation. ● Install a complete Python runtime including dependencies in one go: using our install-pyrun installation bash script, you can install PyRun as well as all dependencies using a single install-pyrun -r requirements.txt run. ● Commerical Support: eGenix provides commercial support for PyRun, in case you need custom builds, help with the integration or need problem solving support. eGenix PyRun integrates a few standard Python extension modules, which rely on system provided third-party libraries to be available on the build system as development versions, and on the target system as binary versions. If you want to compile PyRun yourself, you will also need the development packages of the above tools, a C compiler and a GNU make compatible make installed. ● from sources by compiling your own version. The following sections explain these options. We will look into making eGenix PyRun compatible with Windows in one of the upcoming releases. To simplify the installation of eGenix PyRun and make it as easy to use as virtualenv, we've created a shell script called install-pyrun that you can download from our server. It is also distributed in the source archives of PyRun in the PyRun/ folder. The script is a simple bash script, so you can inspect it with any text editor. Thank you for using eGenix PyRun. Type "help" or "license" for details. The script comes with a set of options to customize the version, platform, Unicode variant and also allows disabling installation of setuptools and pip as well as permit installation from a local PyRun archive. Install eGenix PyRun in a given target directory. tools are downloaded from pypi.python.org. The exact versions of pyrun, pip and setuptools listed in the above output may be different in case you downloaded a more recent version of the script. install-pyrun will use curl as default downloader, and fallback to wget, if curl is not available. The script defaults to operating the downloaders in secure mode, i.e. all links are HTTPS links and all certificates are verified before proceeding with the download. Both the pypi.python.org and our downloads.egenix.com servers use HTTPS for enhanced security. install-pyrun also supports the useful pip install -r requirements.txt instruction, so that you can set up a complete Python runtime environment in one go. Simply create a requirements.txt file using the same format as supported by pip and then pass the -r option to install-pyrun. If you'd rather install eGenix PyRun manually, you can do so by downloading the prebuilt binaries yourself. Please see the next section for details. The lib/pythonX.X directory is used as location of the Python libraries and automatically put on sys.path in case it is available. Optional packages installed through distutils or setuptools will go into the corresponding lib/pythonX.X/site-packages/ directory. The include/pythonX.Xdirectory is only needed in case you want to compile Python C extensions. It is available as part of the prebuilt binary distributions we make available. For Python 3, the include directory has the ABI flags appended. For Python 3.4, this is include/python3.4m for most Python installations. Please note that while eGenix PyRun itself is fully relocatable after installation due to the relative search path, the tools setuptools and pip are not. They hard-code the paths into their scripts, so you can not relocate a PyRun installation, after these tools have been installed. To facilitate shipping custom external libraries with PyRun, newer versions of PyRun (2.1 and later) add an rpath setting to the binary which results in the dynamic linker on compatible systems to first look in these directories for shared libraries such as OpenSSL, SQlite, ZLib or BZip2 libraries. or SQLite. The rpath setting defines a dynamic library search path which is used if no LD_LIBRARY_PATH OS environment variable is set. The $ORIGIN entry is a placeholder which is replaced with the directory of the pyrun binary by the dynamic linker at load time. The above path first looks in the same directory as the pyrunbinary, then in the ../lib/ directory and then in the OpenSSL site-packages directory. The latter is added to simplify using our egenix-pyopenssl package with eGenix PyRun. The package ships up-to-date OpenSSL libraries inside the package directory. You can override this rpath by setting the OS environment variable LD_LIBRARY_PATH. A linker search path given in LD_LIBRARY_PATH will then be prepended to the search path. If you want to compile your own eGenix PyRun executable you canyou're your own default rpath by adjusting the PYRUNRPATH variable in the PyRun/Makefile. This will install the distribution you just built, install it locally in a test directory and run a few tests, including pip installations of sizeable packages such as NumPy, Cython and Django. Note that only the installation itself is tested, not the packages themselves. eGenix PyRun uses the standard Python freeze tool, which you can find the Tools/freeze/ directory of the Python source code distribution to combine the Python interpreter with a large subset of the Python standard library into a single-file Python runtime. We have applied a few customizations to the freeze tool and ship separate versions for Python 2 and Python 3 with the source distribution of eGenix PyRun. ● we added patches to Python (PyRun/Runtime/Python-*.patch) and the Modules/Setup files (PyRun/Runtime/Setup.PyRun-*) to be able to statically link in extension modules that would normally be built as shared modules and to provide a pure-Python implementation of the Python command line interface. The PyRun/Makefile extracts the Python source code, applies the patches and adds the Modules/Setup file. It then creates the pyrunX.X.py freeze.py template, the pyrun_config.py module and runs PyRun/Runtime/freeze/freeze.py on the generated pyrunX.X.py file. freeze.py then generates the frozen module versions and a Makefile in PyRun/Runtime/Makefile which can then be used to build the pyrunX.X executable. The PyRun/Makefile also takes care of installing the executable together with the include files and optional shared modules built during the process; as well as packaging the builds into binary .tar.gz files, which can simply be extracted anywhere in the file system to "install" eGenix PyRun. The easiest way to have modules or whole packages added to PyRun is to modify PyRun/Runtime/pyrun_extras.py and import them in that file. freeze.py will then automatically find the modules and referenced packages, freeze and add them to PyRun. Alternatively, you can also edit the PyRun/Runtime/makepyrun.py file and add the modules/packages in the configuration section near the top of that module. In a future version of eGenix PyRun, we're going to simplify this process so that you can pass the modules to include as parameter to the build script. If you want to further reduce the PyRun file size, you can remove additional modules/packages from the frozen binary by editing the PyRun/Runtime/makepyrun.py file and adding the modules/packages to the remove lists. In some cases, this may not be enough to completely remove the modules/packages, e.g. if you still have other modules in PyRun which reference the removed modules/packages, freeze.py is going to re-add them in the module search process. To overcome this limitation, you will have to additionally add the modules/packages to the PyRun/Makefile EXCLUDESvariable. In a future version of eGenix PyRun, we're going to simplify this process so that you can pass the modules to exclude as parameter to the build script. eGenix PyRun provides a robust production runtime environment, but has to make some compromises due to the way it is built. This section explains the enhancements and known incompatibilities compared to a regular Python installation. This is a list of changes we have applied compared to standard Python. Unlike the compatibility fixes listed in the next sections, these are features that are not necessary to get eGenix PyRun to work, but ones that we think are slightly more useful than the standard Python choices. In Python 3.4, the Python I/O encoding is determined by looking at the locale of the process. Depending on the used system, this can be UTF-8, ASCII or some other encoding. Since we think it's better to either correctly set the encoding via an environment variable such as PYTHONIOENCODING and not guess, we chose to define a default for the PYTHONIOENCODING which is used, in case this environment variable is not set. The default for PYTHONIOENCODING in eGenix PyRun 3.4 is "utf-8:surrogateescape". This allows pyrun to work in most situations without failing prints or weird encoding exceptions. If you do have a different setup or would like exceptions for non-UTF-8 data to be raised, you can set the PYTHONIOENCODING environment variable to override this default. It is even possible to have eGenix PyRun revert back to the locale scanning behavior by setting the PYTHONIOENCODING variable to "" (empty string). Since PyRun is normally used in isolated environments in which per-user installations are not really wanted, we have disabled the flag ENABLE_USER_SITE in site.py of the standard library to disable setup of the user-site configurations. This means that PyRun will not automatically search these user site-packages directories and also not install into them. It also means that sys.path search run faster and startup time is a little better as a result. Note that PyRun's site-packages directory is always set up relative to the location of the PyRun binary, so using user site configurations should not be needed. If you want to simulate a user site installation with PyRun, you can create a local installation of PyRun based on a system-wide one by either copying the binary or simply creating a symbolic link in a user's subdirectory. PyRun will normally run outside any build directory installations. We therefore save the startup costs for the special check to detect PyRun running in the Python build directory. The site.py setup module checks for the availability of a lib/site-python directory and adds this to sys.pathif found. Since this directory is hardly ever used and very uncommon for the isolated run-time environments for which PyRun is intended, we have disabled this addition. Even though this results in making Python 2.7 more secure, it also means that that Python 2.7 now needs access to a reliable and up-to-date trust store which has the trusted CA root certificates. HTTPS requests to websites or servers which don't provide certificates listed in those CA root certificates will be rejected, unless the application code explicitly permits such connections. This will in many cases result in Python not accepting CA Cert certificates or self-signed certificates anymore, which are often used in test setups or by embedded systems. When set to 0, PyRun will use the unverified SSL context for HTTPS connections per default, just like Python 2.7.8 and earlier did. Setting this variable to 1 will force the default to also verify the HTTPS certificates. Note: Future PyRun versions may adopt a possible new Python environment variable to do the same. In standard Python 2, the attribute is always set to "<frozen>". In standard Python 3, the attribute does not exist at all. This poses many problems to software relying on this attribute for reporting and debugging purposes (e.g. to show the location of an error) or produce coverage reports. Since it's impossible to fix all this third party software, we chose to alwas add the attribute to frozen modules. The attribute is set to "<pyrun>/package/module.py" for all modules frozen into pyrun. This allows most uses of the attribute to work without problems. Some modules also use this attribute to locate external resources relative to the module location. Since the attribute does not point to an existing path, this will fail, so special work-arounds have to put in place for such software. On the positive side, several such modules do take the situation into account that the path does not exist and fall back to other solutions. Since the build time information is normally read from the Python installation files, we had to find a way to make this available without going to the file system. The trick was to use a generated module pyrun_config.py which has the Python config information and can also patch it at runtime to accommodate for the relocation feature of pyrun. Note: Python 3 and later versions of Python 2.7 adopted this trick for sysconfig as well. The lib2to3 package comes with its own pgen2 parser. This parser uses a special set of grammar files for Python's grammar which are embedded into the package. Since we cannot ship those files in the file system, we chose to stored the grammar pickles in a pyrun_grammar.py helper module and patched the package to use these pickles instead. This allows lib2to3 to work without having to read the grammar files and makes on-the-fly conversions during installation possible. An important example of a package which uses this technique for Python 3 support is setuptools. The lib2to3 package scans its own fixes/ directory for available fix modules. In a frozen package this doesn't work, so we preprocessed the list, put it into the pyrun_config.py module and patched lib2to3 to load it from there. While porting eGenix PyRun to Python 3.4 we found a couple of bugs in stdlib modules which we patch in pyrun for the supported Python versions and also reported upstream. Please see the change log on the eGenix product web page for details. In order to have the standard library extensions linked into the pyrun binary instead of having them built as separate module, eGenix PyRun defines additional entries for them in the Modules/Setup file. Several modules are documented there, but not all of them. We extracted the relevant information from the Python setup.py file and added it manually to the Modules/Setup file for each supported Python version. Since the Modules/Setup process is not nearly as flexible as the setup.py process, configuration of the modules is sometimes very complicated. For this reason we have punted on a few packages such as the ctypes package and instead added them to the distributed binaries as separately installable dynamic shared modules. Note that it is possible to customize these Module/Setup files further in case you would like to add other third party extensions to the pyrun binary. The modules are still built (if the needed development files are found on the build system) and packaged in the eGenix PyRun distribution files, so you can use them, if you need to. However, they are not statically linked into the PyRun executable, so when moving this file around, you have to make sure that the relative directory structure expected by PyRun (see 1.3.4eGenix PyRun Directory Structure) makes it possible to find those shared modules. For obvious reasons, we cannot include the Python include header files in the PyRun executable, since the compiler/preprocessor will have to find them in order to use them. We do include the include files in the distribution packages and install-pyrun will also install them, so it's possible to compile Python C extensions if you use one of those distribution forms. Compiling C extensions is not possible without the include header files, so the single-file PyRun runtime executable is not enough to compile Python C extensions. There are a couple of tricks which Python modules sometimes play, which don't work with frozen modules. Some standard library modules/packages come with non-Python resource files such as binary .exe stubs or data files. Since freeze.py will only find Python modules, these files are not included in the frozen PyRun executable and since the frozen modules/packages don't live in the file system, access to such resource files is not possible via the module/package path. For the lib2to3 package, which also needs external files, we have patched the package and included the necessary grammar files in the pyrunbinary, since it is used by several Python packages during installation on Python 3. The pkgutilmodule which is needed to implement the -m option in Python only has limited support for frozen modules in Python 2.7 and 3.4. It has no support for frozen packages. As a result, running pyrun2.7 -m timeit works, but e.g. pyrun2.7 -m lib2to3 --help doesn't. ● Test modules cause strange errors (mostly encoding errors) when run with regrtest.py. Running the test modules directly doesn't show these errors. Some preliminary investigation suggests that these issues could be caused by regrtest.py modifying the module __path__ entries. Because eGenix PyRun has to emulate the command line options in Python, it is difficult to emulate some Python command line option which take effect in the very early stages of the interpreter startup phase. For some options like e.g. -d (debug level) and -O (optimization level), we have added helpers/patches to Python to make it possible adjusting them from Python. Fortunately, most of the more exotic options are not used in production runtime environments for which eGenix PyRun is designed. Here's a short session installing setuptools, pip and our egenix-mx-base package in an eGenix PyRun installation. Please note that installing eGenix PyRun is much easier using the install-pyrun bash script we provide, which automates the following steps. See 1.3.2Quick install using install-pyrun for instructions on how to obtain and use this script. Now we have a ready to use Python runtime in tmp/, using the default eGenix PyRun directory layout, including some optional extra shared libraries and the include files needed for compiling Python C extensions. eGenix PyRun will just as well install other packages such as Django, Trac, Numpy, Cython, etc. We've tried to make PyRun as compatible with existing packages as possible, so everything should mostly work out of the box for you. Most Python environment variables are supported. Without options, the given <script> file is loaded and run. Parameters are passed to the script via sys.argv as normal. The exact output is subject to changes between eGenix PyRun versions. The meaning of most options is similar to the Python interpreter command line options of the same name. Note that not all options are available, since it is difficult to emulate them in pure Python. Even some of the above options were only possible using patches to Python, e.g. the -d and -O options. Run the given <script> file as bytecode. Compile and run <script> directly as Python code. Enable debug mode. Use -dd for level 2. This generates more debug output to stderr when PyRun starts and also sets Python's debug flag accordingly. Enable interactive mode. PyRun will enter interactive mode after running the script when this option is used. Import and run a module <script> available on PYTHONPATH. The semantics are the same as those of Python itself. Ignore user site configurations. Since PyRun always ignores user site configurations, this flag has no effect. Open stdout/stderr in unbuffered mode. Note that PyRun can only emulate this by reopening sys.stdin and sys.stdout in unbuffered mode. Run PyRun in verbose mode. Use -vv for level 2. The Python verbose flag is set accordingly. Tells PyRun to not write byte code files for compiled files (i.e. .pyc or .pyo files and creating __pycache__ directories for Python 3.4+). Ignore environment variables. PyRun can only apply this for the PYTHONPATH variable, since other variables will already been read during Python startup. Run in optimized mode. -OO also removes doc-strings. Randomize the string hash function. Since this cannot be implemented in PyRun, it stops with an error. Use PYTHONHASHSEED instead. Skip running site.main() and disable support for .pth files. Print the PyRun version and exit. Not implemented. This flag is ignored to stay compatible with Python. eGenix PyRun supports the Python -v and -d command line switches to give you extra information about how processing is done. Both switches enable additional output from eGenix PyRun as well as Python itself, since the command line switches are passed to Python. Please note however that these switches are enabled in Python by the eGenix PyRun command line emulation which is written in Python. As a result, they are not in effect in the early setup stages of PyRun startup and don't include the early startup time information available in Python itself. The -d and -dd switches will also enable the Python debug settings, so you can use this to get additional debug information from Python or extensions compiled with debug support. If you need to debug imports and get more information about how eGenix PyRun executes the scripts, the -v command line switch is useful. It tells PyRun to output additional useful information to stderr and also enable the Python verbose flag which results in Python writing import searches and GC cleanup details to stderr. Since eGenix PyRun also pulls in Python, the respective Python license also applies to the resulting pyrun binary. The Python license is included as file "LICENSE.Python" in the package's main directory as well as the eGenix Third-Party License document. Please note that setuptools and pip are not designed to be relocatable.